Lowbrow March of the Penguins parody follows a flock of penguins on a lewd journey. 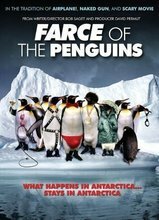 Piggybacking on the runaway success of 2005's March of the Penguins (2005), Farce of the Penguins -- narrated by none other than a self-parodying Samuel L. Jackson and featuring a Who's Who of comedic voiceover talent -- follows a flock of penguins over a seventy-mile journey near the South Pole, utilizing a human soundtrack to inject sophomoric dialogue and gags tailored to elicit easy laughs into staid footage of flock behavior and mating rituals. Jon Lovitz Comic 21-Jul-1957 Yeaaaah, that's the ticket!